I have found that visual art inspires my writing. How this works, I don’t know. But if I go to a museum and look at any kind of art or view someone’s photography (my own included), it can cause a thought process that inspires my creative side for writing. For example, in November, I went to the Peabody Essex Museum in Peabody, Mass. and saw the exhibit Impressionists On The Water. This exhibit, which is on loan from the Fine Arts Museums of San Francisco, includes impressionistic works inspired by water. There are scenes of life by the sea or at the shores of a river. Lots of boats, lots of people, lots of water. It’s a wonderful exhibit. 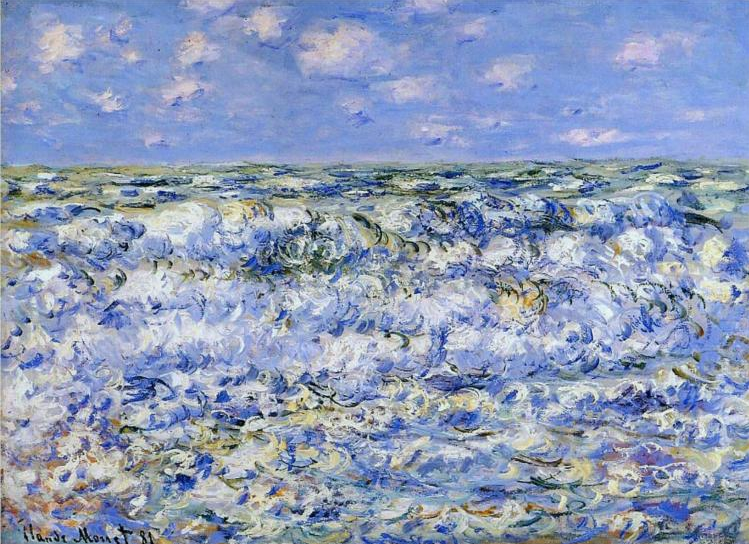 The very last painting I saw as I left the exhibit is the one shown above – Waves Breaking by Claude Monet. I was stunned by the beauty of this painting. What struck me most is that the colors are so vibrant, as if the painting were completed just a week before it was hung. I marveled at it for some time. The painting is over 130 years old. And it looks as fresh and current as if it had been painted quite recently. The description alongside this work said something to the effect that this painting showed that Monet was moving away from impressionism and toward abstract painting. This idea keeps coming back to me. And it makes me wonder if Monet had any sense of this as he painted it – that this painting would be seen as a turning point in his work. I find myself dwelling on this. I picture Monet working on this painting and wondering if he had any thought that he was in transition or would be perceived as having been in transition. Or was he so into his “zone” as he created this that how it would be received was not on his mind at all. When I write, I don’t give thought to structure. I don’t think this is a good thing necessarily – in fact it could be a bad thing. But that’s just how it is for me when I write. I sit and write and before I know it I’m in another world, as if I’ve passed through a portal and I’m relaying in writing a story that exists and is being shown to me. While the story unfolds, I’m as surprised as the reader is later on when they read my books. I’m not thinking about the “archetype” of this character or that. I don’t think about the arc of the story. I don’t create a pivotal moment. I trust that those things will be there when the story is fully told, if I do a good job of it. Because, as far as I’m concerned, the people I am observing are real and the story is real so those things will be there, as they are in real life. So, as I anticipate that a rush of writing is coming my way right now, I keep seeing this Monet painting in my mind. I think it’s an invitation to simply follow the creative energy and not worry about how the story will be received. Just put it to paper and let it be.